It’s pretty easy to get sick of Shanghainese food. Whilst good, it’s sweet, sticky and overly oily. Luckily living in Shanghai means that we have the option of plenty of other regional Chinese and western food. 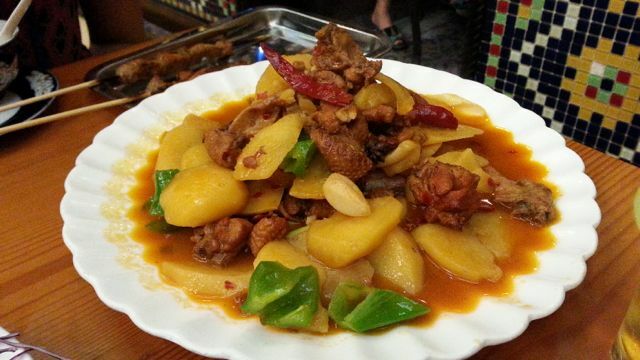 One of our go to cuisines is Uyghur or food from Xinjiang. Characterised by mutton, lamb, cumin, red pepper, potatoes and tomatoes, it’s a perfect combination if you are dire need of a protein and spice hit. It also has a completely different flavour profile to Chinese food which, can very easily get same-same after awhile. It was Saturday and we weren’t sure whether to go out for dinner or not. We had stumbled across a Shanghai outlet of HK’s Dim Dim Sum (more about that in another post!) and we’re still slightly full from our 4pm snack. By 8:30pm we somehow we motivated ourself to walk down to Yakexi, one of a handful of really good Xinjiang restaurants in Shanghai. Arriving way after the Saturday night peak hour of 6pm, the restaurant was still busy, but with crowds beginning to part. We ordered a Dapanji (大盘鸡) Y49 (small), a chicken stew made with cumin, chilli, chicken pieces on the bone and potatoes. It arrived pretty instantly after we ordered which was fantastic as we could immediately dig right in. The chicken had incredible flavour without being too hot, and the pieces of chicken tender. 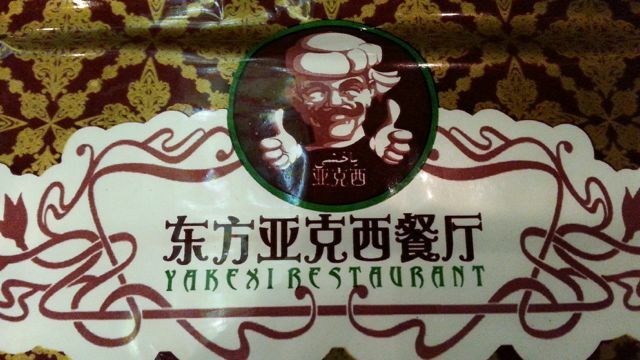 Big thumbs up. Our second dish, Braised lamb chops with naan (馕包肉) Y59 was equally delicious and tender with very little ‘lamb smell’. The soaked up naan was terribly addictive as whilst soggy, had absorbed up all the delicious flavour from the dish and was oh so good. We couldn’t leave without eating a few lamb kebabs (羊肉串), Y4 each, which whilst had a great fat to meat proportion, just wasn’t cook well enough. I suspect that perhaps as we came outside of the peak dining hour, the coals weren’t heated as hot, meaning our lamb was slightly dry having sat there longer. Overall, we were glad we left the house even though we returned home fuller, a little drunk and a mere Y165 lighter. 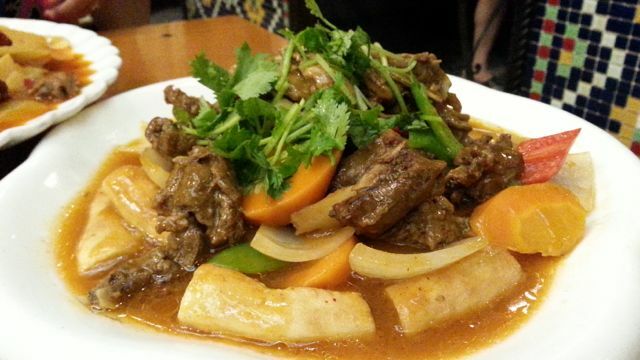 This entry was posted in Shanghai, Shanghai dining and tagged Chinese cuisine, Dapanji, Lamb and mutton, Shanghai, Xinjiang, Xinjiang cuisine. Bookmark the permalink.